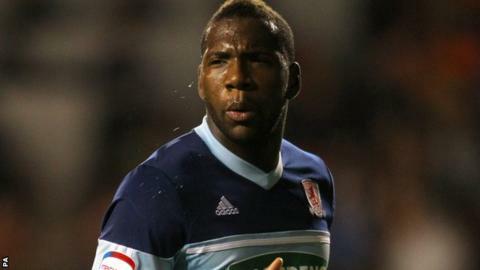 Ishmael Miller struck his first Middlesbrough goal to help his team climb to third in the Championship. The striker, on loan from Nottingham Forest, netted after Faris Haroun had opened the scoring and secured a third straight win for Tony Mowbray's side. Miller's goal came on his return to the starting line-up, having made his comeback from a groin injury as a substitute at Brighton last Saturday. Aaron Mclean missed Hull's best chance as they failed to mount a comeback. A lacklustre Hull showed little of the verve that propelled them to a 2-1 victory over struggling Ipswich last Saturday. Keeper Ben Amos made an early save from teenage winger Adam Reach, but then got into trouble at a couple of corners and had to recover quickly to deny George Friend and Marvin Emnes. Hull were left frustrated as Nick Proschwitz raced on to Mclean's through ball and appeared to be brought down by stand-in Boro skipper Grant Leadbitter, only for the referee to give nothing. Amos, who looked nervous in goal, was left standing five minutes after the restart as Friend crashed a header on to the crossbar before Miller nodded the rebound into the crowd. But Boro then had an escape as Proschwitz fluffed a free header at the other end. Haroun gave the home side the lead in the 59th minute, finishing a swift counter-attack by converting Friend's perfectly-judged pass. Seven minutes later, Friend burst into the box and when Amos failed to hold his shot, substitute Scott McDonald's snapshot bounced free before Miller steered the ball into the net. Mclean had a chance to pull one back with just under 10 minutes to go, but he miskicked Corry Evans's cross wide with the goal gaping. "Ish [Miller] had a great chance at the weekend, running through one-on-one with the keeper but just glancing it past the post. "But all strikers need to score goals to give them confidence when they next go out on the pitch. "That'll give Ishmael a lot of confidence and I thought his performance and physicality gave them problems tonight." "It was arguably the worst we've played since I came to the club and it was a frustrating night because we got nowhere near it, especially after what we did on Saturday. I have to look at myself: Did I not do enough? "What I've learned is that two games in three days is a struggle for us. I just thought the overall energy of the team was nowhere near where it should be. "Nothing's worked tonight. We never looked a threat all night apart from maybe in the last 10 minutes, when it was too late."